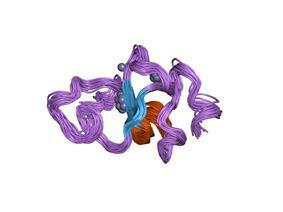 PDB rendering based on 1wen. 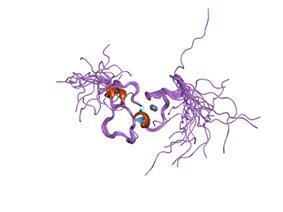 Inhibitor of growth protein 4 is a protein that in humans is encoded by the ING4 gene. The protein encoded by this gene is similar to ING1, a tumor suppressor protein that can interact with TP53, inhibit cell growth, and induce apoptosis. This protein contains a PHD-finger, which is a common motif in proteins involved in chromatin remodeling. This protein can bind TP53 and EP300/p300, a component of the histone acetyl transferase complex, suggesting its involvement in the TP53-dependent regulatory pathway. Alternatively spliced transcript variants have been observed, but the biological validity of them has not been determined. ^ a b c Shiseki M, Nagashima M, Pedeux RM, Kitahama-Shiseki M, Miura K, Okamura S, Onogi H, Higashimoto Y, Appella E, Yokota J, Harris CC (May 2003). "p29ING4 and p28ING5 bind to p53 and p300, and enhance p53 activity". Cancer Res 63 (10): 2373–8. ^ a b "Entrez Gene: ING4 inhibitor of growth family, member 4". ^ Garkavtsev, Igor; Kozin Sergey V; Chernova Olga; Xu Lei; Winkler Frank; Brown Edward; Barnett Gene H; Jain Rakesh K (Mar 2004). "The candidate tumour suppressor protein ING4 regulates brain tumour growth and angiogenesis". ^ Tsai, Kuo-Wang; Tseng Hsiao-Chun; Lin Wen-Chang (Oct 2008). "Two wobble-splicing events affect ING4 protein subnuclear localization and degradation". Exp. Cell Res. (United States) 314 (17): 3130–41. Ozer A, Bruick RK (2006). "Regulation of HIF by prolyl hydroxylases: recruitment of the candidate tumor suppressor protein ING4.". Cell Cycle 4 (9): 1153–6. Bonaldo MF, Lennon G, Soares MB (1997). "Normalization and subtraction: two approaches to facilitate gene discovery.". Genome Res. 6 (9): 791–806. Hu RM, Han ZG, Song HD, et al. (2000). "Gene expression profiling in the human hypothalamus-pituitary-adrenal axis and full-length cDNA cloning.". Proc. Natl. Acad. Sci. U.S.A. 97 (17): 9543–8. Garkavtsev I, Kozin SV, Chernova O, et al. (2004). "The candidate tumour suppressor protein ING4 regulates brain tumour growth and angiogenesis.". Nature 428 (6980): 328–32. Zhang X, Xu LS, Wang ZQ, et al. (2004). "ING4 induces G2/M cell cycle arrest and enhances the chemosensitivity to DNA-damage agents in HepG2 cells.". FEBS Lett. 570 (1-3): 7–12. Kim S, Chin K, Gray JW, Bishop JM (2004). "A screen for genes that suppress loss of contact inhibition: identification of ING4 as a candidate tumor suppressor gene in human cancer.". Proc. Natl. Acad. Sci. U.S.A. 101 (46): 16251–6. Zhang X, Wang KS, Wang ZQ, et al. (2005). "Nuclear localization signal of ING4 plays a key role in its binding to p53.". Biochem. Biophys. Res. Commun. 331 (4): 1032–8. Ozer A, Wu LC, Bruick RK (2005). "The candidate tumor suppressor ING4 represses activation of the hypoxia inducible factor (HIF).". Proc. Natl. Acad. Sci. U.S.A. 102 (21): 7481–6. Gunduz M, Nagatsuka H, Demircan K, et al. (2005). "Frequent deletion and down-regulation of ING4, a candidate tumor suppressor gene at 12p13, in head and neck squamous cell carcinomas.". Gene 356: 109–17. Kim SC, Sprung R, Chen Y, et al. (2006). "Substrate and functional diversity of lysine acetylation revealed by a proteomics survey.". Mol. Cell 23 (4): 607–18. Unoki M, Shen JC, Zheng ZM, Harris CC (2006). "Novel splice variants of ING4 and their possible roles in the regulation of cell growth and motility.". J. Biol. Chem. 281 (45): 34677–86. Raho G, Miranda C, Tamborini E, et al. (2007). "Detection of novel mRNA splice variants of human ING4 tumor suppressor gene.". Oncogene 26 (36): 5247–57. Zhang X, Lin DH, Jin Y, et al. (2007). "Inhibitor of growth 4 (ING4) is up-regulated by a low K intake and suppresses renal outer medullary K channels (ROMK) by MAPK stimulation.". Proc. Natl. Acad. Sci. U.S.A. 104 (22): 9517–22.